the attention that it should and I wish you all the best of luck with it." In the summer of 2017, bikers from across America journeyed to the Legendary Buffalo Chip in Sturgis, South Dakota in search of God, Country and Truth. But these bikers are not what you would expect, as they travel through the majestic Black Hills of South Dakota to the first Light Up the Hills Rally. Here, at the most iconic location for bikers on the planet, these Christian men and women gathered to share their stories and experiences of how they have changed their lives, and have chosen to follow God. Many of the bikers who made this unique journey are serious riders, proud to wear the patch on the back of their leather vest. Others are weekend warriors who ride just for fun. And a rare few have lived the life of outlaw bikers, known as “one percenters”. No matter where they came from, every one of these bikers have one thing in common, a love for Jesus Christ and a mission to share the Gospel with anyone who will listen. The “Chip” and Sturgis are ground zero for the largest biker rally in the world, drawing nearly a million riders every summer. 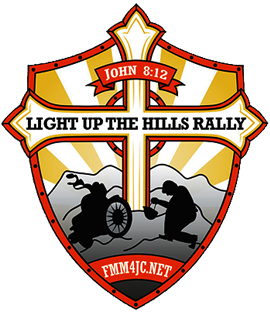 Most come to party…however, this group of riders have a higher purpose in mind and they hope to change the perception of bikers with their faith in God and the rally cry, “I WILL SING, PLEDGE AND PRAY”. The title of our film comes from Eli Seals' powerful anthem, “Sing, Pledge & Pray”, which was inspired one night in a smoky Louisiana Honky Tonk when the country singer decided to perform his unique rendition of the National Anthem. Following Eli’s performance, the crowd stood up and cheered, leaving many in tears of pride and joy. One customer, however, was not so happy about Eli's performance and confronted the singer with his displeasure of having to endure the band's patriotic moment that had interrupted an otherwise great night of country music. Following that night, Eli was motivated to write his iconic song.